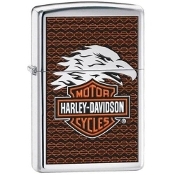 Harley Davidson Eagle Zippo. Polished chrome. Zippo. Includes gift box. Guaranteed forever.